Jesus is everywhere. Or, versions of Jesus, is more like it. Over there, is the republican Jesus, gun in hand, an American flag in the other, taking down wimpy liberals and standing up for truth, justice, and the American way as he walks hand in hand into the promised land with Elvis and John Wayne. In the other direction, we find the liberal Jesus. He understands that the disenfranchisement of the underclass, the poor, the gay, the other, is best explained by Marxist theory. 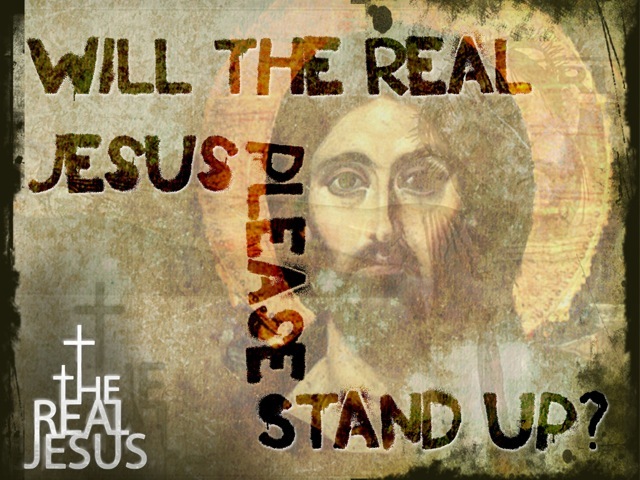 This Jesus is the Jesus of outcasts, just like the Jesus of the bible, or so they tell me. This Jesus loves the poor and empathizes with little Tod who’s dressed in his sister’s favorite outfit. This Jesus thinks that having three kids with three different dads, none of which live with mom or the family, is A-OK. Especially when a big welfare state is there to help out. That way the real dads are off the hook and the state will be the father. Because the state loves you and will sing you to sleep, play hoops with you and give wise advice and help with your homework, just like a real dad, only better. After all, there are millions of such potential dads called taxpayers that are just as good. Then, there is the apocalyptic, deeply Calvinist, evangelical Jesus. This Jesus is loving but is also really pissed at mankind. “Eat the forbidden fruit and mess up my creation, will you?” he says. This Jesus has heaven and hell on his mind, a lot, a whole lot. For this Jesus, it’s all about the afterlife. “If you died today, do you know where would you go?” He asks. “Probably the morgue,” I answer. But, this Jesus doesn’t like smart-asses. So, looking back to the Old Testament for inspiration he stokes a fire, a flood, maybe an earthquake even, because his wrath will not be quelled. Yes, this Jesus does not like jokes. Not even a little. And then, somewhere out there, off in the fog of history, is a historical Jesus. An authentic 1st century Jew, speaking to his fellow 1st century Jews, in their language and according to their customs. In the story, the bread that fell off the table was the word of God. For Jews, this meant the writings of Moses, David, and the prophets. No one owned a bible. Few if any could read, even a little. Books were the province of the wealthy and were extremely rare. The dogs in the story were the gentiles who were deemed unworthy of God’s word, which was given to Israel, not the gentile nations. The parable of the pearls and swine represent the same story with a slight variation. Healing, more often than not meant to be made whole, as in Israel a “House divided.” Or, Israel divided into the Northern and Southern kingdoms, leaving them ripe pickings for the Lions (the mighty nations) and the lambs who were their victims (the weaker, smaller nations, like Israel.) The ten lost tribes of Israel were lost precisely in that fashion, and the remaining two were ultimately enslaved, as well. When scripture says “By his stripes, we are healed” its prime meaning was that because of Jesus willing sacrifice, we are made whole, first Israel and then the world, all things have been reconciled to God. It is the actions of Jesus, The Messiah that point the way out of the darkness, but only for those who follow Jesus as he leads the way. This was not a reference to heaven, the place above the clouds. It meant that heaven and earth had become one and that Jesus and his teaching, were the bridge between heaven and earth or God and man. This did not displace the moral aspects of the Law of Moses, it fulfilled their meaning. The Law of Moses was the highest expression of God for a Jew. That included Jesus, who saw God as a moral God, which is what the law represented. It was the law code that made Israel, and by extension civilization, possible. Much the way the Constitution or the Magna Carta made democracy possible for America and England, even though all of the above are imperfectly realized. For Jesus, it was the law as an unyielding judge in the hands of the religious leaders, harsh and without mercy, which was his primary issue, “Mercy for me, but not for thee,” that was how the Pharisees and Sadducees used the law, for their own gain. Over and over again Jesus the Jew said, “I didn’t come to change one bit of the law.” Instead, he came to demonstrate the law’s true meaning, separating symbolic ritual from the deeper substance that it was pointing towards. Likewise, the Hebrew dietary laws didn’t make a man righteous. Righteousness came from within, not from without. The Law, primarily the Ten Commandments, encapsulated it all. Even then, the ten could be reduced to two: Love the Lord God with all your heart. And, Love your neighbor as yourself. Jesus did not side with hookers and pimps, tax collectors and thieves because they were acceptable, just the way they were. Nonsense! Jesus said they were sick and in need of repentance and healing, to be made whole. His comparison of societies’ outcasts, with the alleged righteousness of Israel’s religious leaders, was Jesus’ way of pointing out the nation’s sickness. And, more importantly, their need to turn from their sin. But Israel’s leaders would not listen. In the case of the story’s many social outcasts, these were people who were known sinners. And, who were well-aware that they were sick. Jesus may have met people where they were. His intention, however, was not to leave them dead to God in their sin. But deliver them from their circumstance, cleansed and made whole. That is a very partial view of Jesus the Jew, the historical Jesus, speaking and walking thru a thoroughly Jewish landscape. A real man, living in a real time. And, only in that context can we hope to find the real Jesus. Not the Jesus of OUR tradition. No matter how much we may love him. If we truly love Christ “The Redeemer” we will see him as clearly as we can, and as he was. Because nothing else will do.